After deciding to go for the implementation of CDM based on evaluation of various factors discussed in foregoing points and other factors, if any, as per the company policy, it is discussed hereunder how the industry can practically introduce CDM program without causing much disturbance to the plant and personnel. It is needless to mention that the implementation of CDM would be difficult in the working plant than in the plant under construction. Though the factors discussed earlier should necessarily be considered to support the decision to introduce CDM program in the new plant, it would be easy to accommodate in the new equipment or system. The cost of CDM would not be difficult to incur, as it would be included in the overall capital investment for the project. In the plant already working, major hurdles againstacceptance of CDM program would be generally as follows. First major hurdle in most of the working industries is the capital investment proposed to be made for CDM program irrespective of amount of investment involved. It may not be technically possible to carry out modification in the equipment or system to incorporate add-ons required for condition monitoring. No management would like to stop the ongoing production as far as possible, which may be necessary to introduce CDM program, even when the time duration of stoppage is marginal. The shop floor people may resist the introduction of new system assuming that it would increase their work load. Management would be aware about failure of equipment, problems experienced and their nature, process stoppages on this account, etc. and may not agree to implement CDM program based on the data gathered sofar. Once the decision is taken to implement CDM, it is essential to further decide whether to go for on-line or off-line condition monitoring system or combination of both modes depending on various issues discussed. As already discussed in brief elsewhere in the paper, practice of on-line as well as offline condition monitoring has been adopted as a part of preventive maintenance and predictive maintenance in some of the critical electrical equipment. Power transformers, power generators and large sized HV motors are well known examples of on-line monitoring system. CDM systems used on these equipment have been providing useful data of operating parameters for assessing the condition of the equipment, though some vital parts of the equipment have not been covered under CDM due to limitations of technology available at that time. Whatever data generated from operating parameters was hardly analysed to assess the condition of equipment. 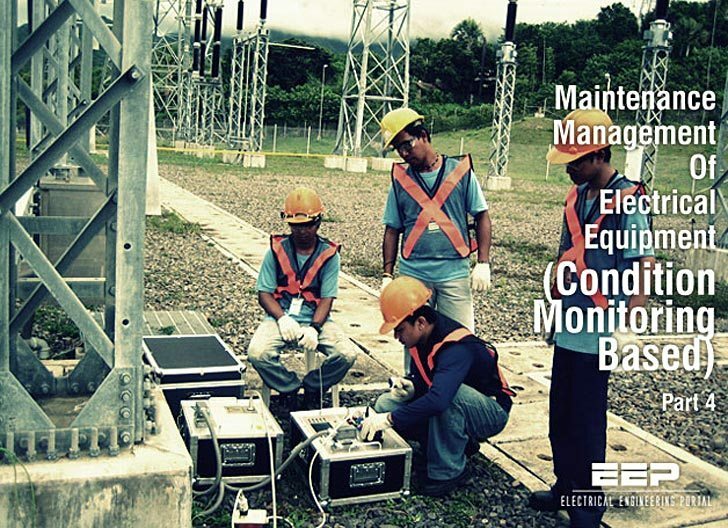 The examples of off-line condition monitoring system are measurement of insulation resistance values for transformers, motors, cables,etc., testing of insulating oil, winding DC resistance measurement in motors and transformers, etc., which are carried out at fixed interval of six/twelve months under preventive or predictive maintenance programs. In most of the cases, the data so generated was not used to plot the trend and further assess the condition of electrical equipment. Necessary corrective action would be initiated in the event of observation of abnormal data, or otherwise the data would remain written in some register. The industries started taking major interest in so-called “on-line” monitoring system since last 15 years of so. The concept of CDM, quite correctly, is based on the belief that if electrical equipment can be evaluated through on-line system, and yet still remain in service, the overall cost of maintenance will definitely reduce. Consider the example of transformer oil. In order to analyse the condition of insulating oil, the sample is to be taken and send to laboratory for off-line analysis.It may take few days to get the report for complete assessment of condition of oil. If, in some way, the condition of the transformer oil could be evaluated while still in service, significant savings in the cost of analysis and cost of maintenance would be realised. Considering example of possibility of on-line monitoring of condition of the transformer oil, such practice would make enormous sense in many situations for many kinds of electrical equipment. Other electrical equipment such as SF6/vacuum circuit breakers, protective relays, small motors, etc. are not as readily accessible using on-line techniques to monitor some vital parameters. Through diagnostic oil tests, the condition of transformers may be evaluated while on-line; however, a complete transformer evaluation would require involvement of parameters such as insulation resistance and/or polarization index readings, winding resistance, insulation power factor, etc. which can be generated only through off-line testing. Ultimately, the decision to use on-line measurements, off-line measurements, or both will be based on an overall evaluation of economicsand system availability.